Ok, here's what I wonder and it's mostly pure speculation. It's partially based on an REO Speedwagon take ("heard it from a friend, who heard it from a friend...") and partly from watching a couple of players, mostly Cope, closely during the game because of what I'd heard. I wonder if the illness bug hit more than just the players we have heard about? For example, either Copeland was completely out of the game mentally, which seems unusual, or he was just not up to it physically. I watched him get pushed around easily by guards several times and he seemed to be gassed far earlier than you would expect. He was hanging his head big time following a number of defensive series. Palmer the same. Neither player seemed to be able to move their feet on defense like they usually do. Again, this is barely informed speculation, but I still wonder. Any take referencing REO Speedwagon deserves an upvote. The players spend a lot of time together and between the locker room and game room they are in fairly close proximity. It would be more likely than not that the flu or other sicknesses go through the team like it would go through a grade school. Roby was sick along with Tom at the Oklahoma State game. So personally I would be more surprised if the sickness bypassed a player...any player (or coach for that matter). "Penn State played its best basketball in over a month, but it still didn’t translate to the team’s first conference win of the season. 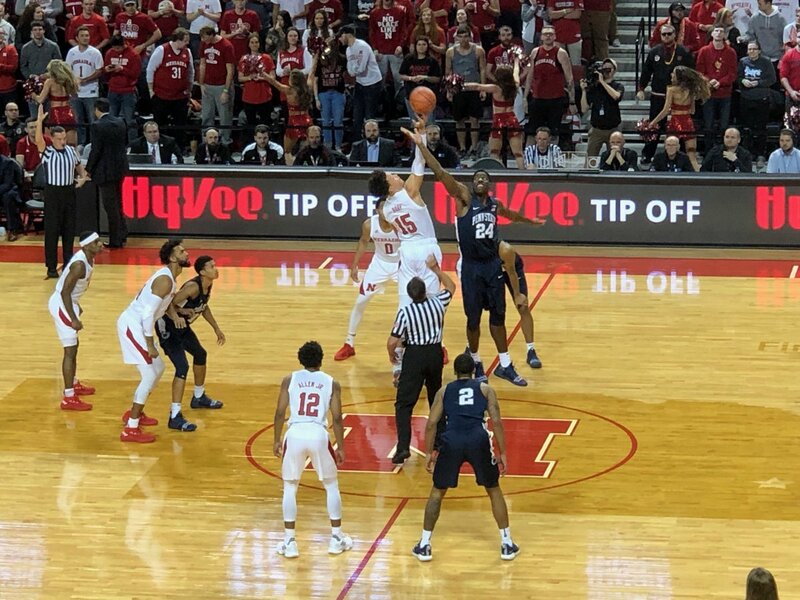 "Playing on the road against a talented Nebraska team, the Nittany Lions played a solid game from start to finish, something they haven’t been able to do this season. But winning on the road in Pinnacle Bank Arena is difficult no matter how good the Cornhuskers are, but Tim Miles has arguably the most talented team of his tenure and Nebraska was able to come away with an 70-64 win on Thursday night. "But despite the loss, there were plenty of positives to take away from Penn State’s performance." "This was easily Reaves’ best performance in over a month, and probably his most complete performance of the season and is a positive sign as the Nittany Lions look to turn around their season." Amir is just coming back. He had a good rebound and that's something we need so his PT should increase. I get that it seemed like some of the guys lacked energy at the end but it really seemed like there was a lack of energy on offense to start the game. Was it by design that we were slowly bringing the ball up the court last night most of the game and if so was it so we would have enough energy to play defense? If that was the case, that's a lack of substitution problem. Saw that after the game. Not as upset about the bench now. I get it. Amir and Nana were both cut off due to health. And Roby stayed out of foul trouble and was doing a lot. And had the matchup advantage on whoever was on him. So I'm good now. There were times the crowd was into the game, and at other times, people sat on their collective hands. Perhaps the choppiness of the game played a role??? I know our section would be standing after an offensive bucket, and tried to rev the engines, and PSU would go back to the other end and score, and the butts would slide back into the seats. Everyone seemed tense. As far as people leaving early...I have never understood it, I will never understand it and I will never like it. Short story, with the game on the line last evening and with only a couple minutes left; the "fan" on my left decided to ask me about the Creighton/Marquette game. She said she felt bad for Creighton. I had to apologize to my family as we were walking back to the car; cause I sort of went off on her. Kinda, sorta....yeah.. If she happens to read this, I apologize! Then again, NEVER is a good time to tell me that you feel bad about Creighton basketball; especially when I am at a tight Husker game. Come on man! I couldn't make the game because of work, we're the students back because the people behind the bench looked my age. 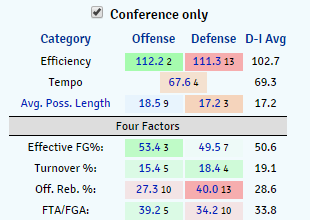 We're deficient is rebounding but for once our eFG% is good. Thus, a team that shoots well, gets to the FT line, and doesn't turn the ball over can overcome a team getting extra looks by losing at rebounding. It's how we won last night. The conference only numbers paint a different picture. Our defense has been sub-standard as while we're still taking away the 3, teams are hitting them against us. We're getting people to miss 2s but they're rebounding a lot of them. 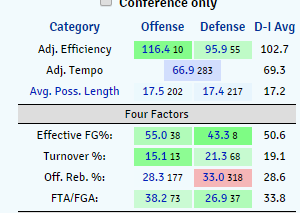 One thing that will really help is that elite foul drawing teams are few in this conference and guess which two? Iowa and Minny of course. Our problem is that we're a defensive team that is better offensively than defensively. It is probably a bit confusing but if we figure it out the sky is the limit. 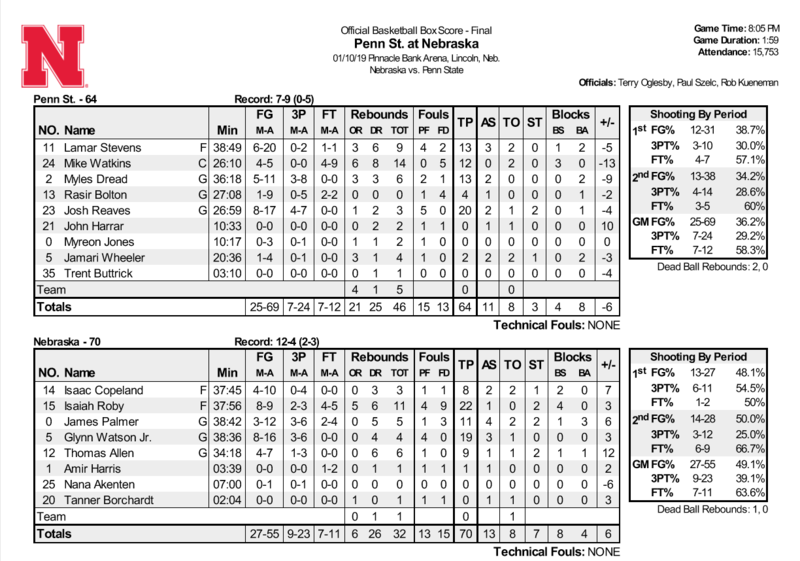 Nebraska can't be 10th in offensive efficiency I have been told Miles is inept offensively. The Huskers have gone 1-2 in our last 3 games but, are Caleb and Jake in a panic? No, they break down the games in a calm, cool and collected fashion. We also discuss who has earned a free pass from criticism and how long this temporary pass will be in effect. We also talk about the next few games and what we expect from the Huskers. We are now on iHeart Radio along with iTunes and Spotify! I don't believe I've seen this posted yet. So PSU brought their "A" game; we brought our "B-" or "C+" game; and we still won by 6 points. According to the CDC (sorry, don’t know how to link on a phone) Nebraska is one of 15 states experiencing a high rate of ILI (influenza like illnesses) so it wouldn’t be surprising if it is making its way around the team. In my office the majority of people are sick. I just got better myself. I like the illness angle much better than our team losing its mojo.